ANITA 1011P with the cover over the printer removed. The printer mechanism appears to be the pioneering Epson EP-101. 4-function, %, storage, (Reverse Polish Notation). Advertisement for the ANITA 1011P from January 1971. "By replacing parts of the circuitry with two integrated circuit chips, room has been made for the printing mechanism while keeping the size of the calculator down to 270 mm wide x 340 mm deep (10.5 x 13.5 in). The chips, one of which carries 750 MOS [Metal-Oxide Semiconductor] transistors, are being supplied by Plessey Microelectronics and Marconi-Elliott Microelectronics". For some users, accountants for example, a permanent print of a calculation and its result was required. 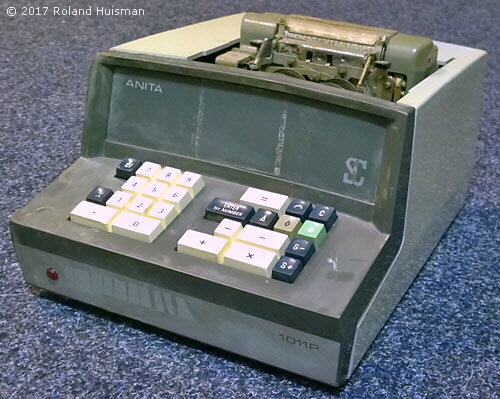 Early electronic calculators with printers were something of a rarity, and nine years after the introduction of the first ANITA electronic calculator this was the first ANITA with a printer. Though previously the company had filled this gap in its products by marketing the Wanderer Conti model which was manufactured in Germany by the Wanderer company. "Printing calculator", Engineering, January 7, 1971, p39.